A beautiful 'embroidered computer' may explode our categories of what computers are supposed to look like. After all, we may think the design of a computer is permanent, but what a computer 'looks like' depends a lot on what era it's from. If it's the 1950s, a computer looks like the ENIAC. It's the size of a room, spread out so that you had to walk in amongst the parts of the computer to program it, plugging in wires like an old-time telephone operator. If it's the late 70s, you probably think a computer looks like the first home computers, like the Commodore PET, with data put on cassette tape. Today, for more and more people, a computer looks like a flat, black, rectangular sheet of glass — a smartphone or a tablet. But could a computer look like this? Irene Posch's "Embroidered Computer" uses golden thread and magnetic beads to act like an eight-bit machine. The Embroidered Computer was created by artists Irene Posch and Ebru Kurbak. 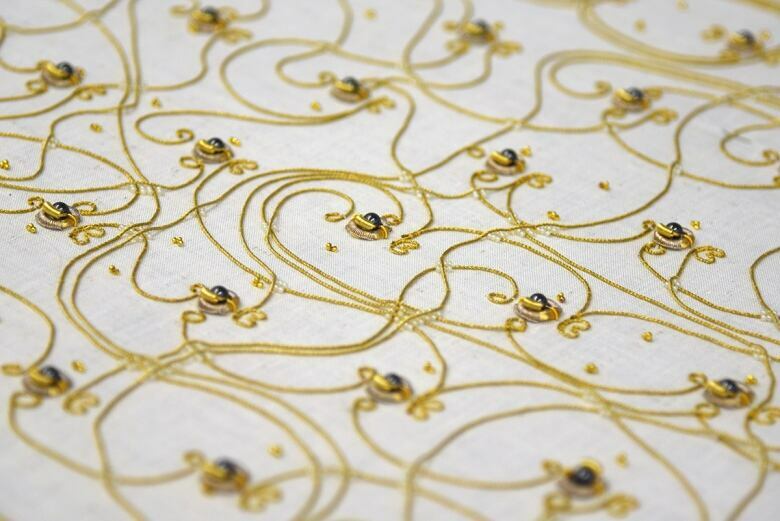 It consists of a couple of metres of linen, which have been beautifully embroidered in swirling shapes with fine golden thread. In amongst the embroidery are a series of beads. "We use gold-coloured copper wire to form a coil, in a donut shape" Posch told Spark host Nora Young. "Then we have a magnetic bead that sits in the middle of this coil, and when this coil is [connected to] power, the magnetic bead is either attracted or pushed away…. Depending on how we power… the embroidered coil, we can direct the magnetic bead in different positions." More gold embroidery on top of the bead will flip one way or another, based on the bead below. The process is analogous to the zeros and ones of computation. As well as being an artist, Posch is a professor at the University for Art and Industrial Design in Linz, Austria. Much of her work and research uses textile art to explore digital technology. In this case, it's not like Irene expects people to start doing today's heavy-duty computing on a two-metre-long, eight-bit golden embroidered fabric computer. But The Embroidered Computer project opens up space to question the design of computers in particular, but also our technologies in general. "I understand The Embroidered Computer as an alternative, as an example, but also a critique of what we assume a computer to be today, and how it technically could be different," Posch said. "If this is actually what we want is a whole different question, but I think it's interesting to propose an alternative." As well as encouraging us to question what our technologies look like and what they do, The Embroidered Computer opens up the 'black box' of tech. "It's a question of understanding, of seeing what's at the base of our digital technologies. It's usually very hidden," she said. Bringing together textiles and electronics, which are normally seen as worlds apart, can bring new insights. "Going into the history of computing we very soon become aware that they're not that apart as we sometimes think they are, if you think of the Jacquard weaving loom as one of the predecessors of computing today."